We run a range of profiling machines with both “magic eye” and cnc controls which allows us to cut from drawings provided in a variety of formats. We flame cut plate from 6mm up to 300mm thick, 10 metres in length and 3 metres wide up to a maximum weight of 10 tonnes. We have recently introduced a High Definition Plasma Machine which enables us to cut profiles from 2mm upto 30mm in Aluminium, Mild (various grades) and Stainless Steels. This machine can handle plates up to 8 metres long and 2.5 metres wide. The advanced software with this machine allows us to “nest” parts more economically and also enables us to provide cone and ducting development services to a number of customers. We are also able to offer folding of plasma cut panels. Profile cutting with 4 heads. A plasma cut entrance sign. 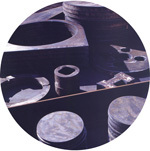 A range of flame cut parts. 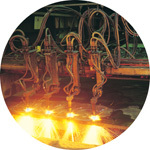 Flame cut and flashground machine parts. An Aluminium plasma cut planter cut and fabricated in-house. Assorted Bosses and Bearing Housings flame cut and flashground.